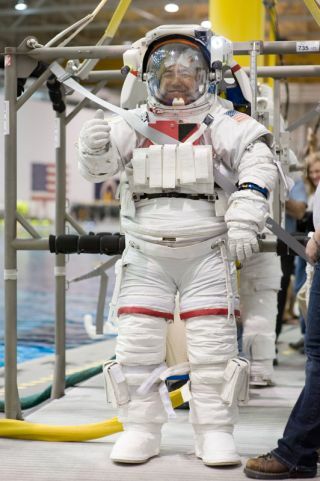 Dressed in a training version of his Extravehicular Mobility Unit spacesuit, Japan Aerospace Exploration Agency (JAXA) astronaut Satoshi Furukawa, Expedition 28/29 flight engineer, is about to be submerged in the waters of the Neutral Buoyancy Laboratory near NASA's Johnson Space Center as part of the training for his upcoming space station mission. Furukawa, who represents the Japan Aerospace Exploration Agency (JAXA), is training to launch on a six-month mission to the International Space Station on May 30. He will be accompanied by two crewmates – NASA astronaut Mike Fossum and Russian cosmonaut Sergei Volkov – when he blasts off aboard a Russian Soyuz spacecraft. NASA astronaut Mike Fossum (center), with Russian cosmonaut Sergei Volkov (background) and Japan Aerospace Exploration Agency (JAXA) astronaut Satoshi Furukawa, participate in an advanced cardiac life support training session in an International Space Station mock-up/training facility at NASA's Johnson Space Center. Furukawa said he lost some acquaintances in the tragic natural disaster, and lamented the fact that tens of thousands of people in Japan lost their homes and are now struggling to recover and rebuild. Furukawa's crewmates, Fossum and Volkov, have also been doing their best to provide support and comfort. "We've mostly been giving him a bit of room," Fossum said. "Especially in the first days after the disasters struck, he was hungry for news of his family, friends and colleagues. So, we've been a sympathetic ear, but he's more hungry to get the news, so we give him a bit of space. It's kind of the same thing we do on orbit – that time that you have to cope with personal things." "I'm looking forward to performing scientific experiments from doctors' and scientists' point of view," Furukawa said. "I am very excited about everything during the mission. I've been training for 12 years – in other words, I dedicated one fourth of my life to astronaut training, so I'm really looking forward to the mission." Furukawa said he is also looking forward to gazing at the Earth from orbit, and he plans to take many pictures of the planet, which he will share with the public via Twitter (Furukawa's name on Twitter is @Astro_Satoshi). "It's been a great partnership and a great benefit to us all," Fossum said. "All of this working for all these years, I helped build it, I helped design it in some ways … and now I get to live on it, not just visit.